As most of you know, over this past weekend of 8/22, Amazon.com quietly updated their terms of service in regards to Prohibited Seller Activities specifically around manipulating sales rank. The update has caused lots of conversation and even more speculation as to what it means. Both are understandable as the added sections are vague and very open to interpretation. As a service provider working with hundreds of sellers from all over the world, we have been thoughtful this week and didn’t want to publish our interpretation of the new terms until we had enough confirming points of data. However, we now have 5 different seller support conversations (phone calls and emails) saying the exact same thing. Literally, exactly the same thing… and it’s vastly different from most of the stories circulating. Even with that and what we will share here, we still encourage you to do your own due diligence and determine what is best for your business. The line that was added and has caused most the controversy is outlined in red. Providing products for free or at a discount in exchange for an unbiased review is a core part of many sellerâ€™s business strategy and this new line has caused many sellers to believe that is no longer within the rules. However, if you look above the red box, you’ll see the rules a seller needs to follow when providing a product in exchange for an unbiased review. The question everyone has had was about the word “excessive.” I’ll get to that in a minute. There is a lot packed into this one. For the most part, this paragraph is pretty clear. You should definitely check your headline, bullet points and descriptions to make sure you aren’t using phrases like “Best Selling,” “#1 Rated,”or anything like that. The rest of this paragraph is pretty straightforward. We haven’t taken this news lightly. On Monday, we sent the updated TOS to all of our clients so they were informed. While we were gathering information and clarity from Amazon, we also required a written re-confirmation from our clients in order to run a campaign. On Monday, the feedback from Seller Support was all over the board. No one gave the same answer. On Tuesday and Wednesday, a unified story started to emerge. I personally have had phone conversations with 3 different Supervisors. We have also been forwarded multiple emails from our clients with their support tickets. When providing a product in exchange for a review – some sellers are providing additional products (same or different) to try and turn negative reviews to positive. This is manipulation of both the review and potentially of sales rank. When providing a product in exchange for a review – some sellers are providing many additional claim code coupons to that same person in order to manipulate sales rank. Example: A buyer agrees to provide an unbiased review for your product, you provide them 20 discount codes. The buyer get 20 units of the same product, while they only can leave 1 review, the additional or “excessive” units manipulate sales rank. I literally was given this exact same example from 3 different Supervisors and again through two of our clients. I asked Support specifically if I could run a promotion of however many units I wanted to give away in exchange for unbiased reviews and was clearly told that I could. The screenshot above is Amazon’s written response to my question about running larger promotional campaigns. It’s Amazon, so only time will tell. Everyone knows you can get a variety of answers from different people. Amazon is still growing as a company and like any large company, the human factor is at play. We really encourage you to do your own homework. Call seller support and have a specific conversation with them about what your plans are for promotions. 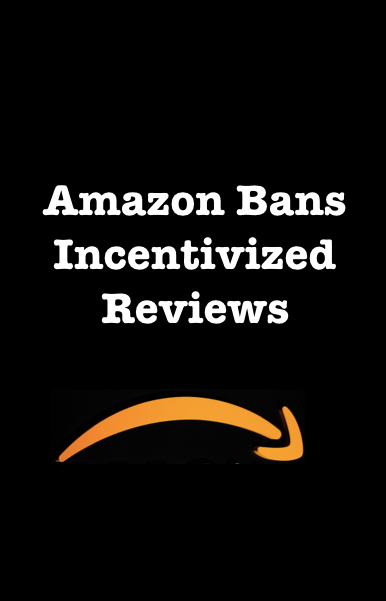 The review system is a huge part of Amazon and they will always encourage sellers to professionally engage with their customers in order to generate more reviews. The price a customer pays or doesn’t pay for that product is irrelevant to the equation. We built iLoveToReview to model Amazon’s own Vine Program…and just like the Vine program, we believe providing products in exchange for unbiased reviews isn’t going away. There is a lot of talk about this amongst sellers and while everyone has their own opinion, here are some thoughts to consider. When it comes to compliance with the new TOS, this is irrelevant. If you are doing a promotion in exchange for unbiased reviews, your intent is to generate reviews, not to manipulate rank. Additionally, any sales above your daily average is going to influence your ranking. If you are selling 30 units a day and you do a promotion giving away even 5 units a day, your sales rank will increase. If you do a promotion of 150 units at one time, your sales rank will increase. Any giveaways or promotions that increase your daily sales will increase your rank…there is no way to avoid it. It’s standard business that when you run a promotion or sales, your volume increases. Period. From what I have been told, their intent with the new TOS is not to impact promotions for reviews that are already in compliance with existing TOS. As a side note, when it comes to actual results, we have run test campaigns for many sellers comparing a one-time blast to drips over time…no one has reported seeing a significant difference. Again, that doesn’t make it true all of the time, but that is what the numbers have showed us. It’s not. It’s all the same…and according to Support this week…that has nothing to do with the updates. At the end of the day, it’s your business, and the decisions you make about how to run it and what strategies to put in place should be based on your own internal guidance system. We will continue our services as we always have. We stay on top of all compliance issues and provide what we feel is the absolute best service in the industry. We will continue to get better and we’ll continue to provide even more value for the sellers we work with. Those who have been clients throughout 2015 know this to be true. We’ve generated over 28,000 compliant, verified reviews in the last 90 days…and we’ve helped hundreds of sellers build more stable, successful business for themselves. We opened in the UK a few weeks ago and will continue to expand our client base in both markets. Regardless of how you choose to take this week’s news, we hope you crush your goals for the rest of 2015 and have your best year yet.